Kasutera (Castella) is a very popular Japanese sponge cake made from a few ingredients. I am going to bake it in a rice cooker, but of course you can bake it in an oven! I don't recommend baking any kind of cake in a really good rice cooker (it can damage your pot), so please try if you don't mind it!!! Now a specialty of Nagasaki, Kasutera was brought by way of Portuguese merchants in the 16th century. The name is derived from Portuguese Pão de Castela, meaning "bread from Castile". Castella cake is usually sold in long boxes, with the cake inside being approximately 27 cm long. 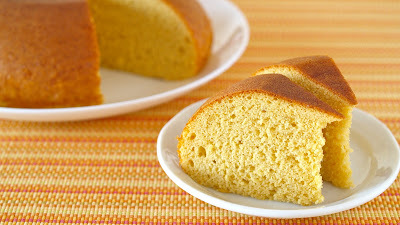 It is somewhat similar to Madeira cake, also associated with Portugal, but its closest relative is pão-de-ló, also a Portuguese cake. There are similar types of sponge cakes named after the same fashion, in French: Pain d'Espagne, in Italian: Pan di Spagna, in Portuguese: Pão de Espanha, in Romanian: Pandişpan, in Bulgarian: пандишпан, in Greek: Pantespani, in Turkish: Pandispanya (Castile is a former kingdom of Spain comprising its central provinces, thus Pain d'Espagne and other variants are quasi-synonymous to "bread from Castile"). 1. Warm the milk in a saucepan. Add honey and mix well. 2. Place the eggs and sugar in a large bowl. Beat them with an electric mixer until white and fluffy. 3. Add 1 in 2. Place the bowl over a pan of hot water. Mix until the batter continuously drips back into the bowl like a ribbon when you scoop it up. 4. Sift in flour and gently cut through the mixture with a spatula until combined. 5. Butter the pot of the rice cooker and pour in the mixture. Drop the pot lightly on the counter to raise the air bubbles out of the batter. Place the pot in the rice cooker, close the rice cooker, then press the button to start. *When it is half-baked, press the button to start (cook) once again. 6. When it's done, let cool on a wire rack until warm. Then place it in a plastic bag (to keep it moist) to cool completely. It tastes even better the next day after the flavors have settled! Bake in an oven at 170C (338F) for 10 minutes. Then turn down to 140C (284F) and bake for 40-45 minutes.